Oxi or Oxy. No matter how you spell it, oxygen bleach is a hot commodity in the laundry and household cleaning worlds. How does it work and do you really need it around the house? Oxygen-based or all-fabric bleach is a gentle bleaching agent that removes stains, whitens, and brightens laundry and is safe for use on almost all types of washable white and colored fabrics. Because of its chemical ingredients, it works more slowly than chlorine bleach, is less corrosive and damaging to fibers, and is more environmentally-friendly. Different brands of oxygen bleach may contain sodium perborate, sodium precarbonate, or hydrogen peroxide as ingredients. Some formulas also contain other ingredients such as dyes, fragrances, or anti-caking products. When the dry bleach powder is introduced to water, the main chemical component oxidizes to help remove soil, stains and cut through residual detergent and fabric softener build-up that stiffens fabrics and dulls color. 2BO4, or sodium precarbonate, Na2CO3·1.5H2O2, are the active ingredients) are more stable and will retain their cleaning power much longer than liquid formulas. The powder is easy to use and can be mixed in warm or cool water to create just the amount needed for each application. Powdered oxygen bleach has a shelf life of several years. 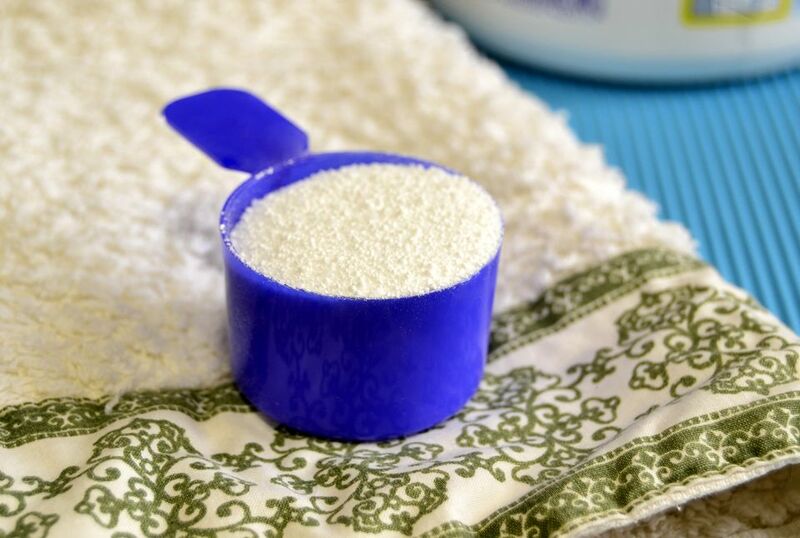 Over time and exposure to air, the active chemicals in powdered oxygen bleach will revert to environmentally-friendly natural soda ash or borax after the oxygen is released. Liquid oxygen bleach formulas are actually a dilute solution of water and hydrogen peroxide, H2O2. Liquid oxygen bleach will break down more quickly after opening, especially if exposed to light, eventually leaving only water molecules, H2O, behind. Even unopened, the shelf life is six months or less. For many years, laundry detergents of all types have added the same chemical ingredients that constitute oxygen bleach to their formulas. They have called them brighteners or whiteners. The popularity of stand-alone oxygen bleaches has prompted many manufacturers to add the term OXI to brand labels. Yes, oxygen bleach is in there but in very small quantities. Oxygen bleach will boost the cleaning power of your regular detergent and the powdered formula is often added to homemade laundry detergents. In both top and front-loading machines, add the powder to the empty washer tub first, then add clothes. As with any product, take a moment to read the package directions because each brand is slightly different. Follow the directions as to how much product to use per gallon of water or load of clothes. Oxygen bleach can be used in any temperature of water. If the water is exceptionally cold, some powders may not dissolve easily so mix with a cup of very warm or hot water first. While oxygen bleach is safe on most fabrics, it should never be used on silk, wool, or any garment that has leather trim or wooden buttons. To use oxygen bleach for stain removal or to brighten white clothes in a sink or separate container for soaking, it is best to mix the powder or liquid solution with the water before adding clothes. Completely submerge the stained garment and allow it to soak for as long as possible, up to eight hours or overnight. Since oxygen bleach works slowly you will get the best results by allowing fabrics to soak for at least one hour. Oxygen bleach does not disinfect fabrics of viruses and bacteria. Choose another method for disinfecting laundry, if needed. Oxygen bleach solutions work well to remove stains from carpet and upholstery. Mix a solution of oxygen bleach and water following package directions and blot onto the stained area, trying not to oversaturate the surface. Allow the solution to work for at least 30 minutes and then blot away the excess moisture with a clean white paper towel or cloth. Repeat as necessary. Oxygen bleach can also be used to clean grout between tiles, shower walls, brick and exterior siding, ceramic and granite countertops, plastic furniture, and sports equipment. Follow product directions for solution strengths. Always follow up after cleaning with a good rinse with plain water. Without rinsing, a powdery white residue can remain.